Speed and quality of delivery is very important to us; we want you to be more than satisfied with our service. Our postage and packing prices include just that, the cost of the postage, the envelope and packing time. Please be aware that if you claim your item has not arrived – Royal Mail Terms & Conditions mean that you have to wait 15 Working Days, from date of postage, before you can claim the item is lost in their system. Given that items are now having to be sent 2nd Class Recorded Delivery it is unrealistic to expect receipt of your order 24 hours after you receive the email saying we have despatched your order. It is worth noting that we find a high proportion of missing items are held at local sorting offices or are held by a neighbour or colleague. But as your parcel will now need to be signed for, Royal Mail should leave a card indicating this. However there are times when these are misplaced or not left at all, so if possible please check first. Fathers 4 Justice DOES NOT accept responsibility for items being lost by Royal Mail, or any other party, after the point of postage. Please check with your out-sourced supplier. We reserve the right to cancel the sale and not supply product if we have reason to suspect your order is fraudulent or we believe there will be a problem with your order. Before returning any goods, you must contact either ourselves, if the item has come direct from us, or our out-sourced supplier for the T&C’s. Never dispose of any product prior to refund, even if faulty. Return goods in the original packaging. We recommend Recorded delivery, unless otherwise specified, (covers up to £41.00) as proof of posting or Special delivery (over £41.00). Use of these is up to the customer, but customer accepts full responsibility for lost item if it is not covered . Please note that the image previews generated at the point of reaching the basket are only visual approximations. These approximations includes the colour of the t-shirt, the position and colour of the text, and the clarity of the image on the garment. There are a couple of general exceptions to our returns policy. Fathers 4 Justice aren’t able to accept returned items that have clearly been worn and washed (unless there is a manufacturing fault with them) or are soiled, dirty or smell of smoke or perfume. We can’t accept items back that (in our opinion) have been deliberately damaged or have been subject to excessive wear and tear. All returned items must be in un-worn condition and should be returned with the original packaging. Prices are in British Pounds and include VAT at the current UK rates, where applicable. As all products are completed to order, payment is required upon order. You can pay by credit card on-line or through a PayPal account. Payments are processed through PayPal. Payments are secured via SSL to encrypt payment details for added security. When you place an order, either we or our out-sourced supplier will send you an acknowledgement to the e-mail address you have supplied. We will then check product availability and the details of your order and will send you further e-mails to confirm acceptance of your order and provide despatch information. If we are unable to fulfill your order for any reason, we will inform you as soon as is practicable and refund any payment you have made, in full. Every attempt has been made to clearly represent the final products in the images shown on the website including the t-shirt colour, design colour and design position. Small variations are possible, however, due to computer screen settings and manufacturing processes. If your delivery address is different from your billing address, we may contact you on your landline telephone to confirm delivery details. For full details on our delivery and returns policies, please visit our delivery page. Delivery charges as detailed either by us or our out-sourced supplier. If you wish to cancel your order, please e-mail us as soon as possible on office@fathers-4-justice.org if your order has come direct from us, or our out-sourced supplier. 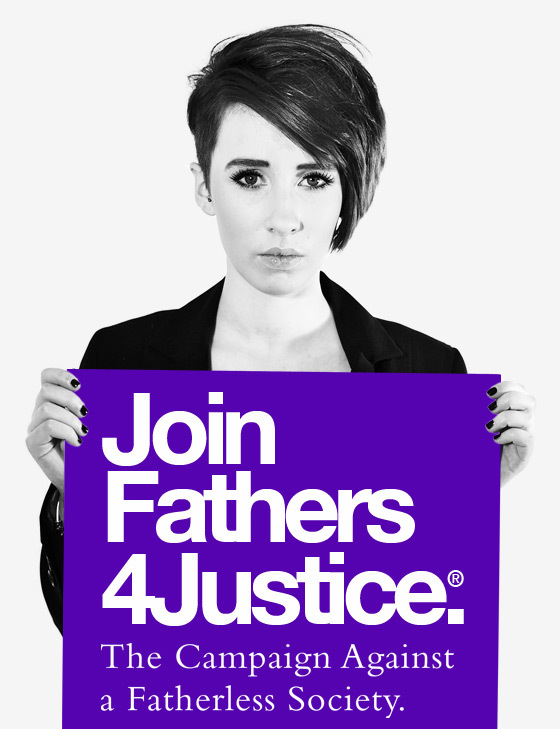 The use of the Fathers 4 Justice website and these terms and conditions are governed by and interpreted in accordance with the English law and the jurisdiction of the English courts shall apply. All purchases shall be deemed to have been made in England. All possible care is given to ensuring the products sold are fit for purpose. However, the purchaser is responsible for satisfying themselves that the goods purchased are safe and suitable for the person for whom they are intended. Fathers 4 Justice cannot be held responsible for injury or damage caused by misuse or inappropriate use of any products purchased from this site. If any of these terms are found to be unenforceable or invalid, it will not affect any other clause, all of which will remain in full force and effect. We reserve the right to change these terms and conditions whenever we deem necessary. Changes will come into force as soon as they are posted onto the website. Nothing in these terms affects your statutory rights. We respect our customers’ privacy. We do not disclose your email address to any external third party. If you have supplied personal information during the purchase process, we will use your e-mail address to confirm your order has been received and then again to let you know that it has been or will be despatched. We will also let you know by e-mail if we are unable to supply any part of your order for any reason. We may also use your e-mail address to send you information, offers, articles available on-line and other related information and products that may be of interest to you from Fathers 4 Justice or our additional projects. We may also record which products you are interested in as well as general customer visit patterns and site use. We maintain security and privacy of your personal details at all times. Users who wish to learn about substantial site updates can join our newsletter mailing list. Recipients of the newsletter can remove themselves from our mailing list at any time by following the instructions found at the bottom of our newsletter emails. All Visual Materials, Names, Content and Intellectual Property Copyright © Fathers4Justice 2019. All Rights Reserved. Fathers4Justice® and F4J® are Registered Trademarks. Subscribe to our newsletter to stay up to date with the latest help and campaign information from Fathers4Justice.